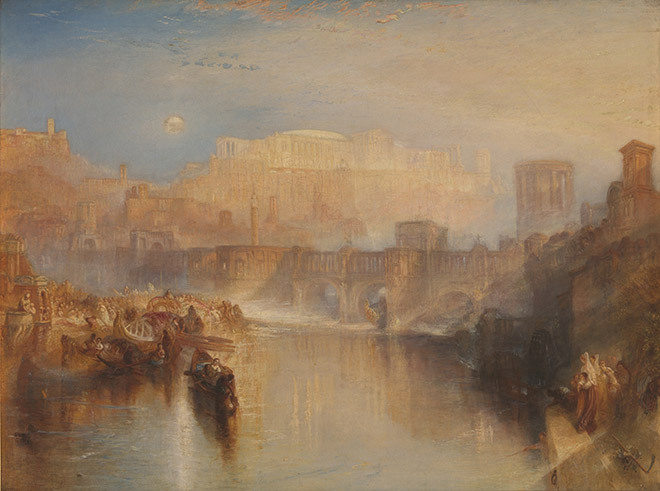 Joseph Mallord William Turner is a canonized, critically acclaimed painter active from late 18th to mid 19th c. Britain. His name is synonymous with the genre of landscape painting, and his legacy ensures a significant audience of baby boomers at his exhibit currently on at the Art Gallery of Ontario. Yet, when compared to the androgynous cocksure appeal of David Bowie, or the politically charged work of Basquiat (two artists whom held blockbuster exhibitions at the AGO over the past few years), it’s easy to assume a man portrayed by the jowl-y Timothy Spall in 2014’s Oscar nominated Mr. Turner would have the youth appeal of a Tony Bennett Christmas album. Nonetheless, for young people to overlook his work based on the admittedly tiresome theme of “white man paints landscapes” would be a loss. Turner was no ordinary old white guy, and his landscapes no ordinary postcard. The current exhibition, on loan from the Tate Modern in London, boasts over 50 works, and for the following reasons and more, is worth your time. There’s a common trend in contemporary painting to make art historical references that only stretch back to around Abstract expressionism, giving any outsider the impression that art began and ended with theorist/critic Clement Greenberg and his swaddle of formalists. Yet, when you look at the sort of marks artists like Rothko and Pollack were making, you can follow them to indisputable references to Turner. Rothko’s thinly applied layers of oil paint that amounted to meditative, awe inspiring blocks of color owe reference to Turner’s own varying application of paint and thoughtful play of light. 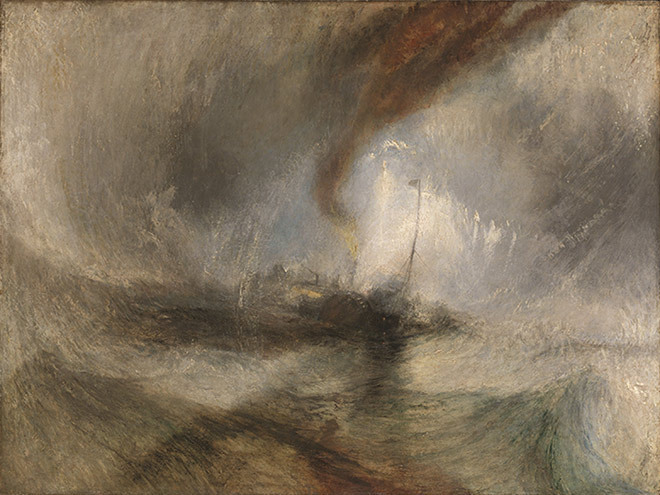 While Jackson Pollack’s work can be seen in referencing the attack style application of certain turner’s including the featured piece: Snow-storm: Steam-boat off a harbor’s mouth, 1842. More contemporary artists too owe dues to Turner, such as contemporary artist Anselm Kiefer’s devastating landscapes. There is an obvious parallel between Turner’s 1844 piece “Rain, Steam and Speed – The Great Western Railway” and Kiefer’s Nuremburg, 1982 or Eisen-Steig 1986, both of which feature obfuscated, gritty portrayals of modern industrial technology, albeit for distinctly separate purposes. Whether in direct reference, in subject matter or in application of paint, Turner’s legacy shows up time and time again in art. 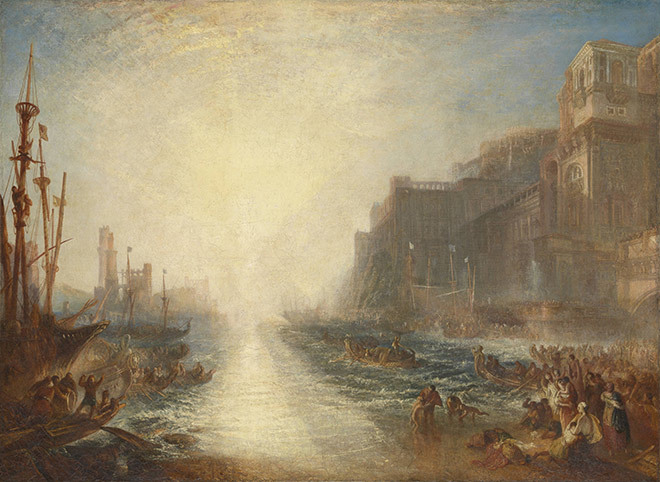 Turner is most notoriously known for his take on disaster as the renowned master of “the sublime”, an art historical term referring to the uncanny beauty and awe that occurs during episodes of apocalyptic chaos. The contemporary artist Stephen Andrews (who has two works featured in the exhibit) is an explicit example of the application of Turner’s sublime in encountering real life tragedy. Andrews’ claimed the painter’s work enabled him to comprehend the unfathomable tragedy of 9-11 and resign himself to the forces of color theory and the nature of light. Through hurricanes, snowstorms, chaotic sea and sky-scapes, Turner has created a lens through which we can fathom and appreciate the awesome power of disaster. Despite Turner being born on the “right” side of the 19th c. British class system and receiving a quality education, he was a real man of the people. With the demeanor of a bus driver and the manners of a construction worker, he was known to communicate through a variation of grunts. A thorough drinker, good-natured but bad-tempered, Tuner’s the kind of guy you’d want to pull a chair beside in the pub. Turner, who inspired much criticism regarding his work during his lifetime, followed a strong lineage of landscape painters who he turned to for inspiration. 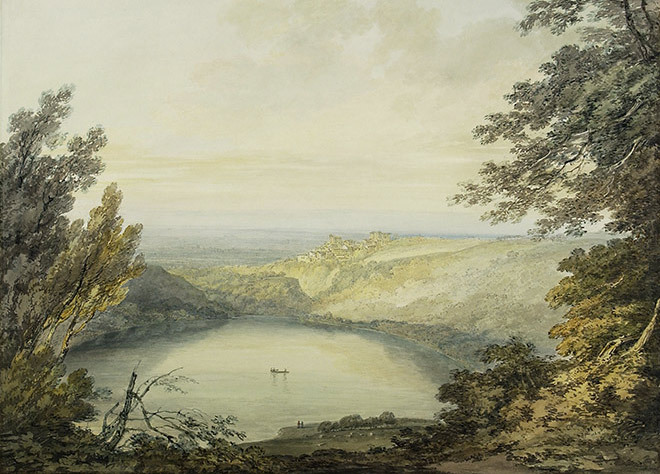 This includes seascapes by painters like Albert Cuyp and landscapes from the great Claude Lorrain, of which he once said “I shall never be able to paint anything like that picture” in reference to a Lorrain work of Italy drenched in sunlight. It’s undoubtedly reassuring to know that a man heralded as a master of his craft too suffered from the anxiety of influence. For any aspiring young artists, the road to success seems long and impenetrable. 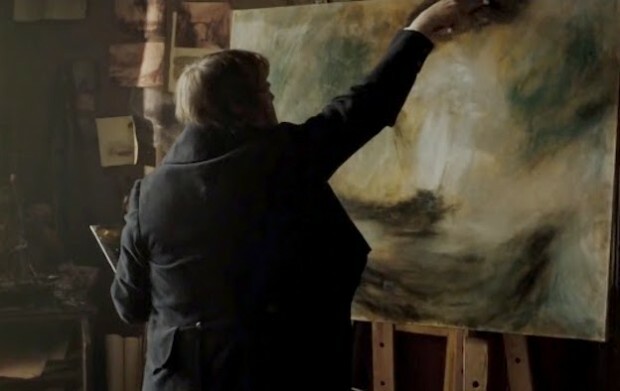 Turner, rather than rely on the frustratingly ambiguous concept of “innate genius” is a testament to the power of hard work. The incredibly industrious painter completed several hundreds of works over his lifetime and kept working well into old age. Overall, Turner’s title as “landscape painter” does little justice to an artist whose work laid essential foundation for contemporary art, and whose breathtaking work exceeds any decorative role, amounting to a testament to the experience of light, of disaster and human awe.